Petlinks Scratchers Welcome Mat makes scratching more fun for your kitty with feel good texture of sisal, interchangeable snap-in catnip toy that dangles overhead, and refillable catnip pouch. Scratching helps keep claws in fine shape by removing an irritable scale that grows with the nail in which scratching helps relieve. Behind the sisal is a small pouch compartment that can be filled with catnip to lure in your kitty. Snap-in feather toy can be replaced with any Petlinks Snap System toys for long lasting fun. 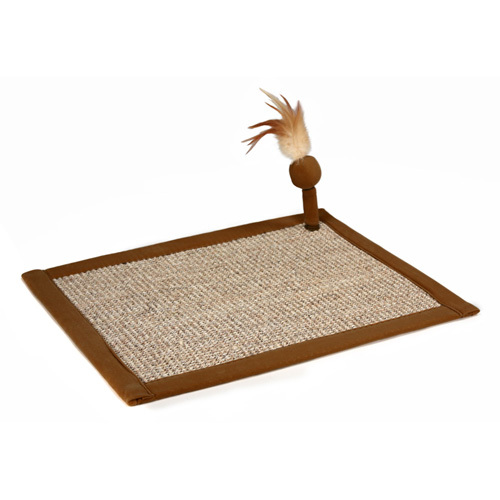 Just roll out the Petlinks Scratchers Welcome Mat and watch your cat immediately make a detour! Pure Bliss Catnip included. Assorted earth tone colors. Size: 14" x 18". I have been looking for these scratcher mats. They are great to nail to the back of a couch where kitty wants to scratch. do this before your couch gets damaged. Although the kitty toy does not stay around very long (cats are tough on it) the mat is a great place to spread a small amount of nip on. My cats actually scrap over who is sitting or clawing on it. Had to buy a second one so they each had there own place to get scrappy with. Good thing is you don't trip on it when walking across the floor in the dark. Had to be with the cats when the toy is installed. They really went for it. Took it away when I wasn't watching them because they would have torn it up.